This is really exciting for the Pacific Northwest and the Seattle area - the region's only Latino bank, and one of five in the nation, is #2 in assets. This puts the Seattle metropolitan area on the map as an emerging Hispanic market. Kudos to Plaza Bank for its commitment to bilingual service and financial literacy. You'll note that my posts are not quite "real time" here, but I do my best. Hope you are enjoying them, and I appreciate your comments! 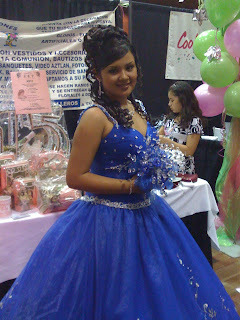 On Sunday we went to Expo NW's Mi Quince y Mi Boda Expo at Bellevue's Meydenbauer Center. This is the second annual event showcasing vendors targeting brides-to-be, early teen girls, and families in general, with beautiful gowns, photography services, specialty cakes (from Safeway and oh, the kahlua cake from Pasteles del Angel was HEAVENLY), reception halls, and other must-haves for your perfect Quinceañera (a rite of passage for 15-year-old girls in Latino culture, which would look to us gringos like a wedding in terms of scale and cost), or an actual wedding. Oh and Best Buy was there, too. And State Farm. Well, I can see why State Farm fits in--they're helping families, reaching out to those who are making changes in their lives. And State Farm is a constant supporter of the Latino community here locally. Best Buy had a great cell phone deal but I'm still not sure I understand the direct tie-in. They sure had a lot of staff at their booth though! I wonder how many were Spanish speakers. That was one thing we noticed--that several of the exhibitors didn't speak the language, and that event certainly draws Spanish-dominant consumers. ¿Qué pasa? Of course, Univisión was there as well, which was expected as they have the only Spanish-language LOCAL weeknight newscast, in addition to carrying all your regular telenovela favorites. And Radio Sol, our "live and local" Spanish station was there, too. And the bilingual paper Tú Decides, of course, as the Expo NW and Tú Decides companies are actually a wife-and-husband team. Miss Washington, a Latina, took the stage and there was also a fashion show. But our favorite part was the focus on health. They had partnered with the Susan G. Komen Breast Cancer Foundation, which was brilliant. There were plenty of second-hand dresses that had been donated, which were offered at a fraction of their original cost. And all proceeds from dress sales went to the Foundation. In addition, the Foundation had a table set up with Spanish-language materials (and English, too) and even a model breast to help educate event-goers on what to look for in your self-exams. This particular table was a highlight for us and we think that partnership really made the event. For a Latino event, however, this one was very subdued--no energetic Latin beats to perk it up. The attendance was good (better than at last year's event) and we imagine that with each passing year, the event will grow in exhibitors and attendance. We hear that its Pasco counterpart has really taken flight. 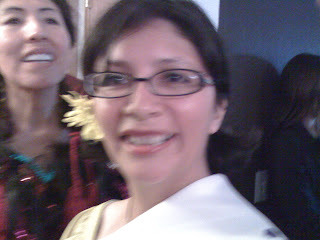 Questions to ponder: Are Latinos on the eastern side of the state more traditional? Do they embrace ethnic events more heartily? Are they just used to the sun coming out, and don't let that stop them from spending a day inside? We do know that there are pockets in Eastern Washington, such as Pasco, whose populations are more densely Hispanic--but in the end there are more Hispanics permanently residing in Western Washington (about 400,000). We believe, with time, the organizers will continue to make inroads, the Bellevue event will continue to grow and attendance will showcase the Latino community right here in the Seattle area. At least those who are getting married, or turning 15. And their parents. SATURDAY NIGHT started at 4pm at Jorge's house in Bothell. I would guess there were more than 100 people there, gathered to celebrate Bolivia's independence from Spain. Most of them were of South American roots, but there were a few tagalongs like me there, too. We all had fun. It was a potluck, and all kinds of delicious foods filled the outdoor table: macarones, sopa de maní (peanut soup), stewed pork, and other hot dishes. We drank beer and visited, until the program started. Yes--there was a program! 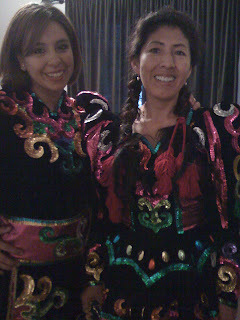 We listened to a poem in Spanish called "If Simón Bolivar lived in these times," heard from some terrific musicians who really put their heart into it, and watched some of the traditional Bolivian dances. Some of their dress was quite bold, even sequinned (think: Liberace) while others were more what one would imagine: modest and hand-embroidered. 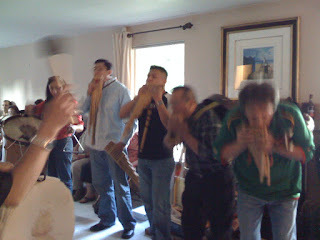 At intermission, the dancers broke for a quick swig of coctél de naranja (OJ mixed with singani) from a shared tutuma. As night fell, people were still coming through the front door. All ages, kids and grandmas and everybody in between. Latinos seem to enjoy making their parties a family affair, everybody sharing, and the more the merrier, no matter what time they arrive. Offering food, offering their seat, offering to dance. The gringa left the party on the early side (hey, I had climbed Mt Si that same day!). As I left I could hear the whistling of the Andean quena and enthusiastic clapping. I'm told that the party carried on until the last guests left at 6am...14 hours after the red, green and yellow balloons out front beckoned the first guests.